Our Mission is to take amazing Boudoir photos that give you pause, and make you go “WOW, that’s me? I LOVE it!! !” It doesn’t matter how old you are or what size you are. We treat you the same way we treat a model, and you receive proper wardrobe and posing guidance. The end result is the stunning you that was always there, just waiting to come out. Prepare to have a side of you come out you may never have thought existed! Together we plan your session, including your comfort level, wardrobe and setups. We can use Pinterest boards to get a feel for what we want to accomplish in your session. We break the norm on how a session works. Rather than limiting you to a short amount of time, we offer larger blocks of time, knowing that it takes time to get comfortable. And part of the experience is the fun of the session! So you get extra fun! Prepare to be blown away by your photos! We are going to have fun! And you are going to look amazing! It’s all part of the experience. Not only do I know how to use light and posing to make you look your best, I also have an awesome studio located in Washington, NJ. 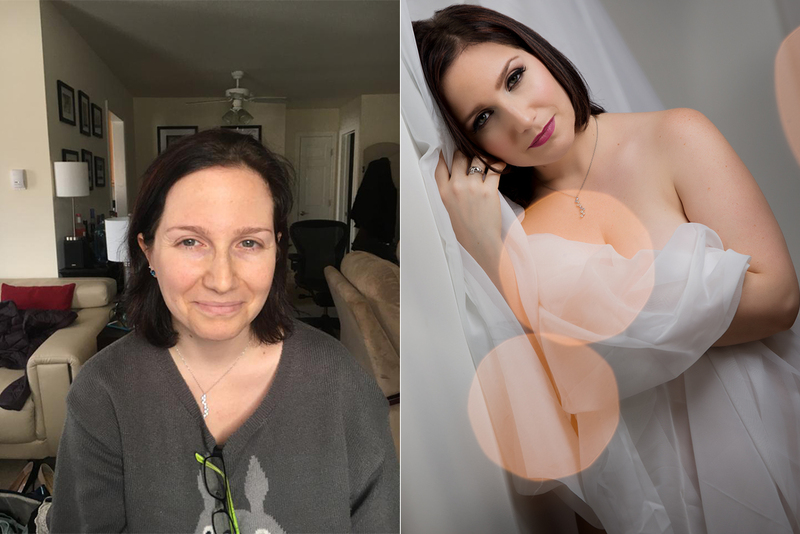 I am partnered with an amazing make-up artist. Like myself, she works primarily in boudoir and weddings. She is MAC certified, and can be added to any session. There is nothing like a physical print or album. Whether for yourself, or someone special. We have an a amazing selection of print, photo book and album options for your photos to be printed on! We respect your privacy. We will not share your images without your permission. We do offer additional retouched images in exchange for you letting us use them.